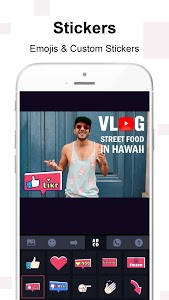 Vlog Star helps you easily create Youtube Vlogs, Instagram Stories, TikTok videos and more. Make awesome and professional videos! - Use film-level video filters to make a leap of the video quality. 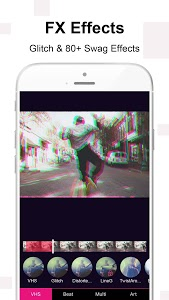 - Choose from dozens of cool FX video effects which ranges from glitch, VHS to retro, film. 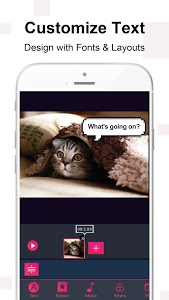 - Adjust video brightness, contrast, saturation, vignette, temperature and more. - Use beautiful text opener as the intro for your vlog video. - Custom your text with fonts, stroke, shadow, animation features. - Provide hundreds of stickers including fx, vloggers, emojis and more. - Hundreds of no copyright music and sound effects available for choice. - Provide 50+ amazing transitions and keep updating more. - Use transition effects to create a pro and cinematic video. - Powerful reaction video maker. You can record and make your reaction video without using the computer. - Search videos on YouTube and record your reaction directly. - Pause and comment during your reaction recording. - Add frames for the PIP videos. - Trim and cut videos. Split one video into two. - Crop video into landscape, portrait or square ratio. - Merge multiple videos into one. Helpful for making YouTube, Instagram, Facebook, Tik Tok videos. - Adjust video speed to make your video more stunning. - Fast / Slow motion video maker with speed adjustment up to 4 times. 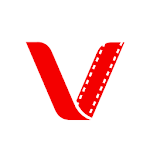 Download the powerful video editor for vloggers -- Vlog Star. You can also be the director of your life! - Improve Reaction Cam feature. Now you can pause during the recording. - Fix the bug of some videos not showing the correct ratio on Samsung devices. Similar to "Vlog Star for YouTube - free video & photo editor"